Eden Hazard is “magical” on the training pitch and showed his talent in Chelsea’s win over Bournemouth, says team-mate Ross Barkley. Hazard scored the only goal with just six minutes remaining as the Blues squeezed past Eddie Howe’s side on Tuesday night to reach the Carabao Cup semi-finals, where they will face London rivals Tottenham over two legs. Barkley started last night’s match but was substituted on 61 minutes, replaced by Hazard who came off the bench, and the England international feels he knew a Chelsea goal was coming. “The way we were playing, you could see we had the belief that a goal was going to come,” he told Sky Sports. “When Eden got that goal, he can produce magic moments like that. Credit to him and the team who got stuck in. “He’s playing really well. He’s up there with the best in the world. He can produce goals like that out of nothing and to play with a player like that is fantastic. He’s relaxed, but once he’s on the training pitch he’s magical. He plays with enjoyment. He scores goals and creates goals. He’s laid-back, but on game day he’s ready to make things happen. Hazard has been in blistering form this season, registering 10 goals and nine assists in 20 games across all competitions. The Belgium international enters the final year of his contract next summer and is torn between signing a new deal and joining Real Madrid . He was doubtful for Wednesday’s win over the Cherries – having picked up a knock in Chelsea’s win over Brighton on Sunday – and is likely to be involved against Spurs in the last four, with ties on December 8 and December 22. 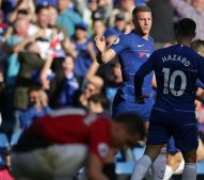 Barkley is under no illusions that it will be a hard test for his Chelsea team-mates, especially considering their 3-1 Premier League defeat to Mauricio Pochettino’s side at Wembley in November. “Tottenham are a good side but we come into it with confidence and knowing what we need to do to reach the final,” he added. “We will train really hard.